Mahugh Fire & Safety offers a complete training program in the use of fire extinguishers and general fire safety in the workplace and home. We include a segment on Carbon Monoxide safety as an added bonus. Our program has received high reviews and is used by a large number of customers and groups to meet OSHA and insurance requirements. The information presented is relevant to everyone and instruction is geared individually to each group. Training is conducted in a classroom setting and followed up with hands-on experience in the parking lot utilizing our computerized Bullex trainer, the only one in NW Montana. Training can be customized to meet specific needs. Gary Mahugh has over forty five years in active fire suppression work and has many stories to share which keeps the training interesting and there is always a component of “fun” which adds to the overall training experience. 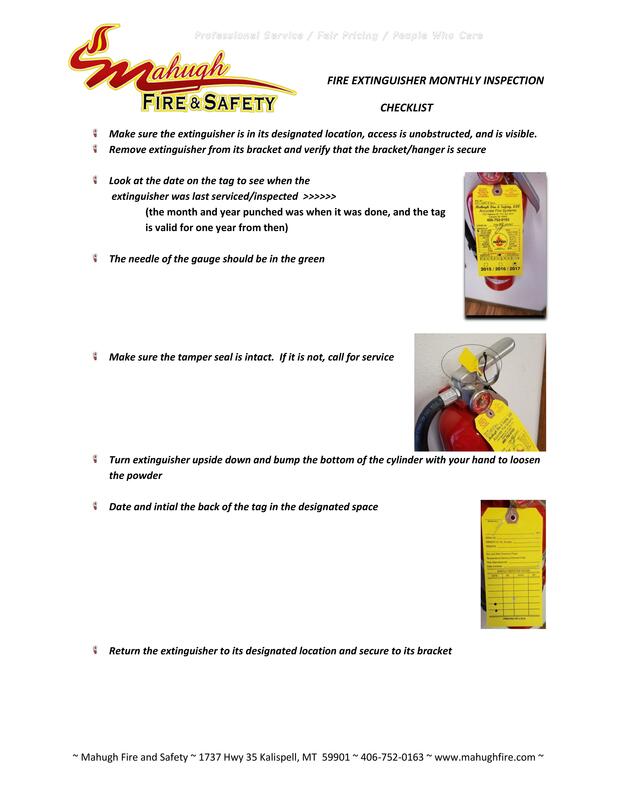 This is just a little checklist of things you should be doing to maintain the fire extinguishers in your home or business. If you have any questions, don't hesitate to give us a call!